An imaginary fiance and an ill-fitting engagement ring. Dangerous cliff-side sleigh rides and gingerbread houses. An unexpected guest who refused to marry her. When Cornelia Quinn returns home from her first term at Smith College nothing is as she expects. After their mansion is damaged in a fire, the Quinns move their Yuletide celebrations to their Newport “cottage.” But that’s not the only surprise–Geoffrey Ford, whom Cornelia was meant to marry until that awful day last summer, will be joining them. But Cornelia can’t allow herself to be distracted by petty things like Geoffrey. 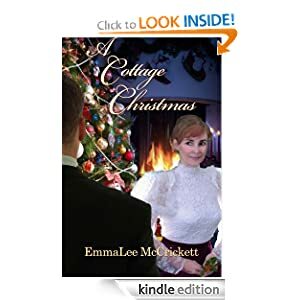 She has come home for more than the holidays–she’s running out of tuition money and she can only get it by claiming the inheritance Grandmother Elisabeth left her, but she’ll have to be engaged before the solicitors will pay out. Cornilia Quinn was heading home for Christmas. She was on break from school, the school she could no longer afford ever since her parents stopped giving her money since she broke off her engagement to Geoffrey. She was getting her story straight about what to tell her parents when they saw her “fake” fiance. She thought of the plan to pretend she was engaged in order to get the inheritance promised to her. Cornelia never thought she would run into her ex-fiance also on the way to her family cottage. Could she fool everyone and get the money to continue school and could she stop longing for the handsome Geoffrey? This was a great holiday read. I loved the way the characters found their way to each other. I enjoyed the busy body sister that kept trying to put Cornelia and Geoffrey together. It was nice to see that in the time period of the story, Cornelia was an independent woman and wanted to make her own way. She knew she could have a man to take care of her, but wanted to know she could do it herself. If you are looking for a great short holiday read, this is a must read.